The 2018 edge class doesn’t have the big names at the top-end like it’s 2017 counterpart, but it has a chance to produce more pass-rushing studs than it’s predecessors. It’s simply a class loaded with question marks. 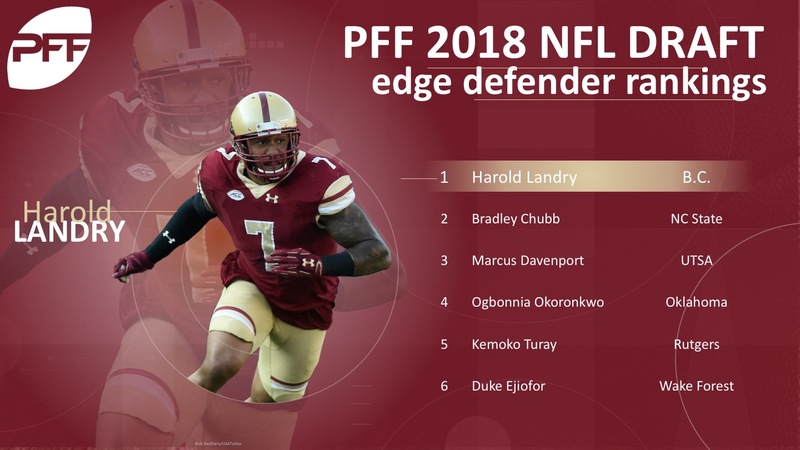 Whether it’s Harold Landry and Arden Key, whose production completely fell off this past year after strong 2016 seasons, Marcus Davenport’s freakish athletic traits dominating weak competition, conference or Hercules Mata’afa playing wildly out of position at defensive tackle, there’s a lot of unknowns in PFF’s top-10 at interior defender. If Landry came out a season ago, he may very well have been a top-10 pick. His high end as a pass-rusher is as dominant as anyone we’ve graded at the college level not named Bosa or Garrett. We can forgive an injury-riddled 2017 when athleticism is such a big part of Landry’s game. Chubb is such an easy projection to the NFL with his blend of size, explosiveness and hand usage, that it’s no surprise he’s shot to the top of many boards. At the same time, he never quite dominated like the man ahead of him on our list and that’s why he takes a backseat for us. Davenport is a total work in progress at this point, but he comes with all the tools needed to finish that job. He was still very productive at UTSA, racking up 51 total pressures this past season, but he looked far more overmatched against better competition during practices at the Senior Bowl. A tad undersized, Okoronkwo has enough length and juice to make us think he can hold up on the edge. Unlike Davenport, Okoronkwo more than held his own at the Senior Bowl and flourished in the actual game with two sacks and four other hurries. Turay was one of the nations best designated pass-rushers as a freshman and sophomore before putting on weight and becoming a full-time player as a senior. He lost some of that pass-rushing prowess, but still has rare flexibility for a big man. Ejiofor matches up with some of the top prospects in this class size-wise, but doesn’t have near the same juice. The encouraging thing is that he’s trended upwards as a pass-rusher every single year of his career. Mata’afa played a grand total of seven snaps this season outside the tackles, but tipping the scales around 250-pounds, the Washington State defender will have to end up there in the NFL. It’s intriguing that he still racked up double-digit sacks from the interior – often blowing past guards and centers at the snap with his lightning quick first step. True sophomores aren’t supposed to dominate the SEC like Key did in 2016 when he tallied 25 combined sacks and hits. His off-field is obviously a concern, but when the only tackle to come close to slowing you down is former first-rounder Ryan Ramczyk, that’s special. Lewis may have been overshadowed by some bigger names on the Ohio State defensive front, but he’s a high-level prospect in his own right. Over the past two seasons, he’s generated 35 combined sacks and hits while displaying the ability to rush from anywhere along the defensive line of scrimmage. He was also one of the top performers at the Senior Bowl garnering six pressures in the game. Hubbard already looks like an NFL vet with his hand usage as a pass-rusher. Unfortunately, he’s limited athletically and was often the weak link on a loaded Ohio State defensive line. Ostman was the most productive pass-rusher in this draft class this past season, notching 54 total pressures. His length and athleticism are lacking, but his production is hard to ignore. Thomas comes ready-made to be an impact-player against the run as a rookie. Doing the same as a pass-rusher may take a little longer. Thomas would flash dominant outings, then disappear far too often. Sweat is as athletic as any pass-rusher in this class, but it’s yet to translate to the football field. He’ll need to develop a handful more pass-rushing moves to make an impact at the next level. Lawler posted the top grade among edge defenders at 91.0 overall last season as he knows how to win with a variety of pass-rush moves and low pad level. His lack of athleticism may hinder his ability at the next level, but his production as a pass-rusher in the run game is worth a look. Nwosu has rare movement skills for a man his size. That never quite translated to pass-rushing though and he may be best as a true 3-4 outside linebacker that regularly drops into coverage. Carter is an excellent athlete, but his four-year production has been mediocre. He picked up eight of his 35 pressures in one game last season (Notre Dame), and his inability to consistently get after the quarterback is a concern given his size and movement skills. Holland came out of nowhere as he put up an, at-times dominant 2017 season. He notched at least six pressures in seven games for Auburn this past season. When Fitts was fully healthy, he was one of the few pass-rushers in this class that could win the edge as a pass-rusher. His career was plagued with injuries at Utah though. Jacobs is a special athlete who may end up having to be an off-ball in the NFL. Jacobs played all of 441 snaps his first four years at Wisconsin before a breakout season this past year. Adeniyi is undersized, yet productive off the edge and he’s worth a look to see if he can maintain those levels against NFL talent. He finished with 14 sacks, 38 hits and 51 hurries on 698 career rushes. Rolland-Jones disappointed in his athletic testing, but he had four years of 80.0-plus overall grades, capping his career with 55 sacks, 30 QB hits and 117 hurries on 1,301 rushes.